Group Cheers with Albariño wine! Learn about the types of fish and seafood caught in the Bay of Vigo and other local produce. Try the best Galician wines and dishes. In between tapas stops your guide will tell you what it’s like to live in Vigo. The tour offers a chance for food and wine lovers to try the best tapas in Vigo, Galicia. What better way to start but to see the fresh products in the food market itself then work up an nice appetite walking on a tapas circuit stopping at the best taverns, bars, and vinotecas in Vigo's Old Port area. Enjoy local cheeses, seafood, galician pie (empanda), etc. washed down with a choice of local red and white wines. Seafood time in Spain's most important fishing port of Vigo! Then quickly on to our first stop at the corner of Constitution Square where there is a small, traditional bar where we’ll try Ribeiro white wine served in typical cuncas (ceramic bowls for drinking). We’ll pair that with local cheeses like Tetilla and canned seafood like the wine made by small-scale artisan producers. Then passing Cathedral of Santa Maria de Vigo we’ll head to a vinoteca (tavern) that specialises in Galician wines. We’ll try a young, red wine that’s made of the Menica grape, accompanied with cured Spanish meats like jamón and chorizo. 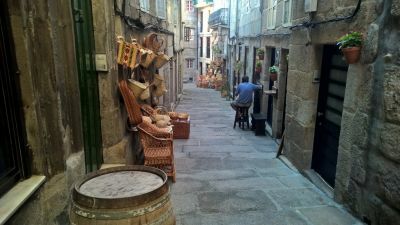 Then more wondering through the old, granite cobbled streets close to the Port, it ´s off to our final stop to try the very best seafood Vigo has to offer! Freshly caught mussels or shellfish depending on what ´s been caught that day paired with the famous Albariño white wine from the D.O. Rias Baixas. Then it’s time to burn off the calories and tell friends about the adventure! 03:15PM approx. : The tour will end at the last stop which right on the port of Vigo. Please wear causal dress and comfortable walking shoes. The starting walk is a thru the city streets with a slight incline. Walking 800 meters to the market from starting point. Total walking distance on tour about 2km total for the tour.